Your pet will now be a #1 FOOTBALL fan with this officially licensed NFL DOG T-Shirt. Dress your dog & cat cute and fashionable, and get ready for Game-Day with this high-end NFL licensed PET T-Shirt! 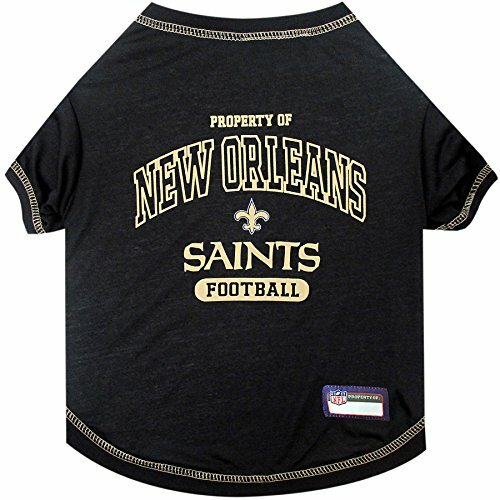 This NFL T-Shirt is designed to fit your pet with maximum comfort and durability!!! Support your favorite team together with your four-legged sporty pup! This unique DOG SHIRT features a screen printed TEAM NAME & LOGO in vibrant team colors! Our Licensed NFL TEE Shirts also feature a woven NFL Jock Tag label for your dog's name! A perfect and SUPER CUTE PET SHIRT for all sports fans! - Great as a gift to your loved ones! Whether you are sending a gift to your new neighbor, new dog, family, friend, boss, co-worker, employer etc... you are sure to surprise them & you can be certain that they're gonna love it! Designed using durable poly-cotton materials with trim stitches! Arizona Cardinals, Atlanta Falcons, Baltimore Ravens, Buffalo Bills, Carolina Panthers, Chicago Bears, Cincinnati Bengals, Cleveland Browns, Dallas Cowboys, Denver Broncos, Detroit Lions, Green Bay Packers, Houston Texans, Indianapolis Colts, Jacksonville Jaguars, Kansas City Chiefs, Los Angeles Chargers, Los Angeles Rams, Miami Dolphins, Minnesota Vikings, New England Patriots, New Orleans Saints, New York Giants, New York Jets, Raiders, Philadelphia Eagles, Pittsburgh Steelers, San Francisco 49ers, Seattle Seahawks, Tampa Bay Buccaneers, Tennessee Titans, and Washington Redskins. Buy the whole NFL Pet Collection & you are sure to be READY for ANOTHER GREAT WIN!!! * Don't forget to check out our Premium Dog Training Pads, AKA the BEST Puppy Pads sold on Amazon! This #1 sports PET Tee Shirt comes in 5 sizes; X-Small Tee Shirt, Small Tee Shirt, Medium Tee Shirt, Large Tee Shirt & X-Large Tee Shirt. For sizing specifications, please refer to the size chart located in image #2, and measure your dog from the nape of the neck to the base of the tail. *** NOTE: Be sure to follow the sizes mentioned on the size chart & do not go according to other brand's sizes! Choose your size and your favorite sports team, and ADD TO CART Now before we run out of stock again!!! * Pets First has gained its reputation in providing every pet owner with premium licensed pet products; from unique and colorful apparel items to fun and playful toys and accessories. * Working with the latest technology, our creative designers choose from the highest quality materials to provide durable, unique and innovative pet merchandise. Our factories follow the highest standards of safety guidelines to ensure your pets’ security, while providing a long-lasting product. Pets First has secured licenses with Major League Baseball (MLB), Major League Baseball Players Association (MLBPA), the National Football League (NFL), National Football League Players Association (NFLPA), National Hockey League (NHL), National Basketball Association (NBA), REALTREE & over 50 of the top colleges in the country (NCAA). When you are a Pet Owner, you are part of the Pets First family! At Pets First we always have you covered! Are you getting ready for game day? We've got you covered...!